Turquoise Yachts is proud to be exhibiting its latest launch, the 77m M/Y GO at the 2018 Monaco Yacht Show. 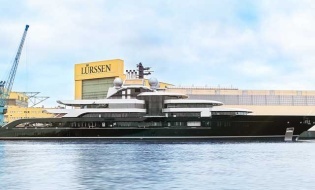 The yacht, which was delivered to her owner in early June, represents a landmark achievement for Turquoise Yachts. She is not only the builder’s flagship but she also represents the yard’s dramatic evolution in technological achievement and workmanship. A modern classic, GO sports a fluidly sinuous exterior profile that is complemented by a rich contemporary interior, both courtesy of London- based H2 Yacht Design. 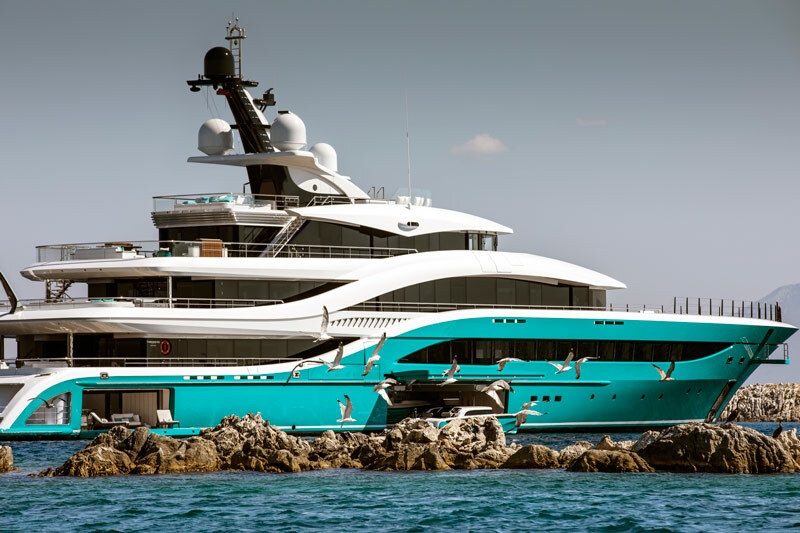 Her turquoise painted hull enhances the connection to the sea and is unified by a “water in motion” narrative that influenced the interior colors, metallic finishes, fabrics, textiles, and stonework. Aboard GO, guests have multiple options for enjoying life aboard to its fullest. The layout includes five spacious decks serviced by a central elevator that operates from the beach club to the open sundeck. The 162-sqm beach club flanked with 2 shell doors and a hidden transom door includes a lounge, bar, massage room and dive store. Amidships on this level is a spacious 12m garage that harbors a 9.6m Pascoe Limousine tender and an 8.6m-day tender. 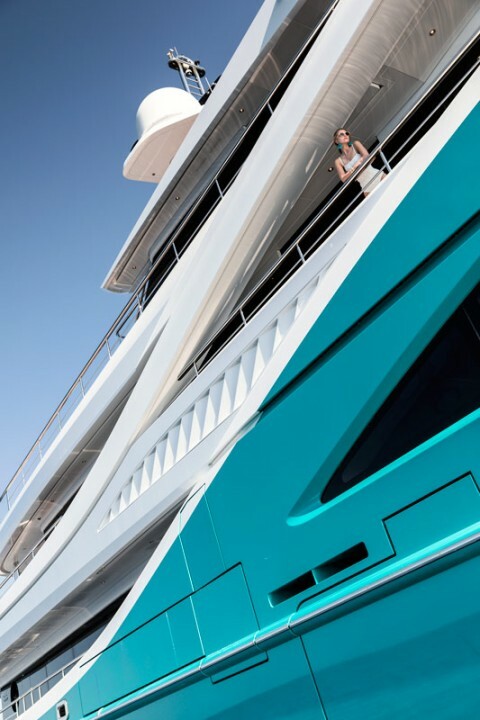 All tenders and toys, including the 5.5m rescue tender, are painted the yacht’s signature turquoise hull colour. The main deck hosts the salon, living and dining area and also offers extensive group seating on the aft deck. Forward of the lobby there are 2 VIP staterooms, 3 large doubles and 2 twin cabins. Each guestroom has a generous marble-clad bathroom with signature Alex Turco art panel in each shower room. Design details throughout the main deck area include edge-lit floating panels that permit concealed mood lighting and shallow recesses for the integration of flush artworks. GO is loaded with detailed craftsmanship; fine joinery, custom loose & built- in furniture and a comprehensive LED lighting system. The collection of abstract art aboard follows the interior narrative using splashes of the turquoise and gold. In the central stair lobby an extraordinary ‘Sea Spray’ Chandelier by Dale Chihuly accentuates the ‘water in motion’ theme that runs through the yacht. Measuring 5.5m in length the piece drops through the open stair from bridge deck to main deck. The chandelier is composed of 468 separate blown glass icicle forms in colours of the sea ranging from clear to turquoise to blue. Multiple angles of the externally-lit Sea Spray Chandelier are reflected in the bevel-edged mirror panels used to decorate the interior. The foredeck on owner’s deck incorporates a touch- and- go- helicopter landing area. Moving aft, the owners personal accommodation includes a large forward facing suite with panoramic views, his-and-hers bathrooms, and dual dressing rooms with spacious wardrobes. Large windows flood the suite with natural light. There is a private foredeck Jacuzzi with table and seating for morning breakfast. Aft, a generous owners lounge leads out over a zero threshold doors to the aft deck where a large back lit onyx table for 14 and a bar with integrated teppanyaki grill are in place for alfresco dining. Overhead infrared panels and integrated in to deck head to keep the night chills at bay. On the Bridge Deck, the wheelhouse is equipped with an integrated bridge system with dynamic positioning. The entire system is based on touch screen control interface through six 26-inch displays assisted by a larger 46-inch chart screen. Additionally, there are overhead touch displays and another wide screen embedded to the helm chair—a total of 19 throughout the yacht. Multiple large screen displays with dock view CCTV features are also integrated into the hidden wings stations. Aft on the Bridge Deck is a teak-floored gym with zero threshold doors that open seamlessly to the aft deck where loose furniture can be cleared to make way for disco/ dance floor area with pop up TV units and a portable sound and lighting system. Up top on sundeck, a 5-meter swimming pool is nestled in the deck in front of the mast, which gracefully joins the raised deck to the whale tail fins that support the main satellite domes. The pool has massaging water jets and a cleverly disguised waterfall feature that cascades from the forward part of the mast.